Martyrs Mamas of Caesarea in Cappadocia, and his parents, Theodotus and Rufina (3rd c.) St. John the Faster, patriarch of Constantinople (595). Sts. 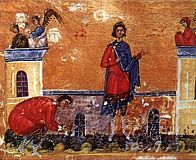 Anthony (1073) and Theodosius (1074), of the Kiev Caves. 3,628 Martyrs at Nicomedia (303-305). Synaxis of the Saints of Saratov. New Hieromartyrs Barsanuphius (Lebedev), bishop of Kyrillov, and priest John Ivanov, and Martyrs Seraphima (Sulimova), abbess of the Therapontov Convent, and Anatole, Nicholas, Michael, and Philip, all at the St. Cyril of White Lake Monastery (1918). New Hieromartyr Damascene (Tsedrik), bishop of Starodub (1937). New Hieromartyrs Herman (Ryashentsev), bishop of Vyaznikov, and the priest Stephen Yaroshevich (1937). “Kaluga” Icon of the Most Holy Theotokos (1748). Righteous Eleazar, son of Righteous Aaron, and Righteous Phineas (ca. 1400 b.c.). St. Hieu, abbess of Tadcaster (England) (ca. 657). Repose of Archbishop Vladimir of Kazan (1897). Watch therefore; for ye know not what hour your Lord doth come. To be vigilant does not mean to sit with your arms folded, but rather to keep in mind that the Lord will suddenly come, to behave and conduct your affairs so as to be ready to meet Him at any instant, not fearing reproach and condemnation. How is one to do this? Very simply. Walk in the commandments, not breaking a single one; and if it happens that you break one—immediately cleanse yourself through repentance and its proper fulfilment. Then everything in you will be clean. And do not leave sin on your soul for a minute; immediately repent, weep in your heart and run to your spiritual father to confess and receive absolution, and then again take on deeds according to God’s commandments. If you set out zealously to be proper in life—you will soon become proper; just don’t remain for long in a fall. Falls in such a case will become ever rarer, and eventually will completely cease, with the help of the all-healing grace of God. Then there will dwell in you the joyful assurance that you will not meet the Lord unprepared. The Holy Great Martyr Mamas was born in Paphlagonia, Asia Minor in the third century of pious and illustrious parents, the Christians Theodotus and Rufina. Saint John IV the Faster, Patriarch of Constantinople (582-595), is famed in the Orthodox Church as the compiler of a penitential nomokanon (i.e. rule for penances), which has come down to us in several distinct versions, but their foundation is one and the same. These are instructions for priests on how to hear the confession of secret sins, whether sins already committed, or merely sins of intent. Before his departure, St. Anthony called his monks together and comforted them with the promise that he would always remain with them in spirit and would pray the Lord to bless and protect the community. He also promised that all those who stayed in the monastery in repentance and obedience to the abbot would find salvation. The saint asked that his remains be forever hidden from the eyes of men. His desire was fulfilled. He is said to have been buried in the cave where he reposed, but his relics have never been found. However, multitudes came to pray in his cave, and there, many who were sick found healing. Eighteen years after the Saint's blessed repose, the monastery brethren decided to transfer his relics to the new cathedral church. The abbot, together with monk Nestor the chronicler, went to the cave to dig up the relics and discovered them to be incorrupt. Accompanied by a large crowd of people, the relics were solemnly transferred to the Dormition Cathedral on August 14, 1092. 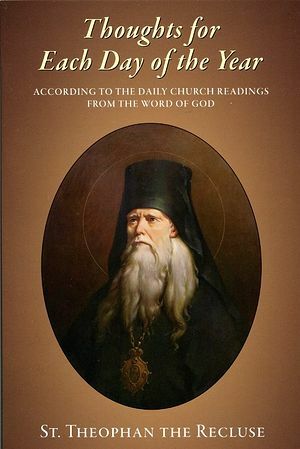 And in 1106 Saint Theodosius was added to the list of canonized saints.